A few months ago, a friend of mine got me hooked on essential oils. She’d sent me some samples of dōTERRA oils to try out last year after I posted about using coconut oil as a natural moisturizer. One that I liked in particular is called “On Guard“- it’s also known as thieves oil (On Guard is dōTERRA‘s proprietary blend of wild orange, eucalyptus, cinnamon, clove and rosemary oils) and is supposed to help boost your immune system. Well, this winter the plague descended upon our house and would just not let up- B and I traded colds back and forth and a fun round of the stomach bug. I was sick of being sick, so I ordered my own set of essential oils. And I’m totally hooked!! My favorites are lavender, lemon, On Guard and another blend called Breathe (mix Breathe into some coconut oil and you have your own natural Vick’s vapor rub minus the petroleum products!) Those have gotten the most use in our house at the end of the cold season. I love using a diffuser to diffuse at least one of these oils in the bathroom during B’s bath (and my shower later). Sometimes I will add a couple of drops directly to the bath water. I also put on a drop or two of lavender at bed time- it relaxes me almost instantly! Many of those suggestions are ones that a lot of you have already heard of, but here are a few more that you might not have heard of! 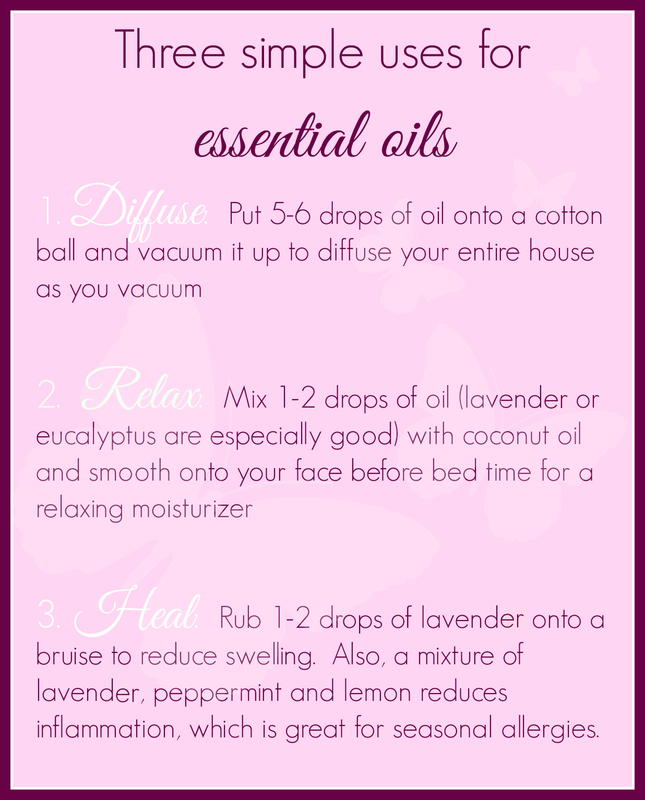 Do you use essential oils? What are your favorite oils to use?